This is Friday, Oman equivalent of your Sunday . We just got back home after another tiring shopping expedition largely for Riamfada. And after I vegetated a while, here I am giving an update. Riamfada is with me now. 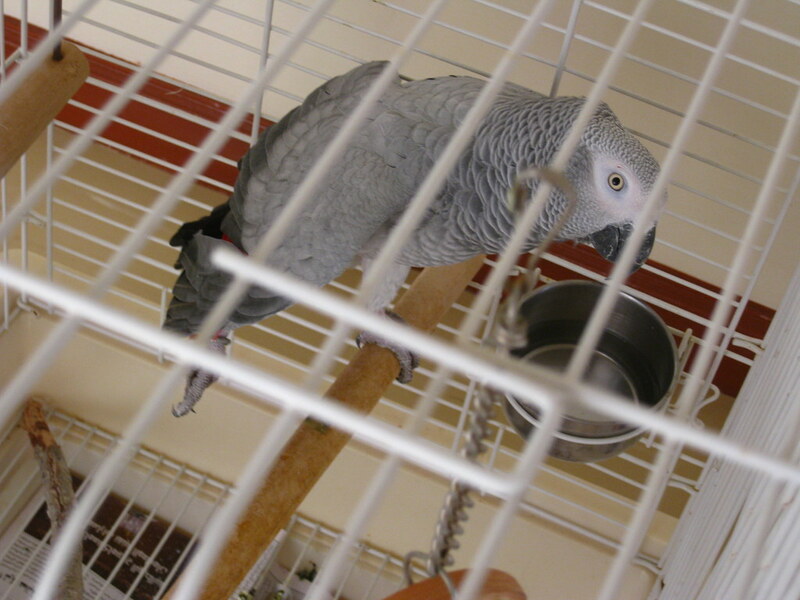 A beautiful Congo African Grey that seemed to be destined to entwined her life with all of us. That include all of you around the world who followed us from Taiwan days and my meandering about on this planet. Again, what we wished for, and what we get can be somewhat very different. You all knew that I had not wanted a grey. I was looking so hard for macaws and Eclectus, especially a Vos. But when I saw her on that evening of 18th Oct 2008, and she bend her head to me for head rubs, I felt that things had changed with that moment. Enough for me to write of it the very next day even if at that time, it was still uncertain if she would come to me. It was as I reported that day. 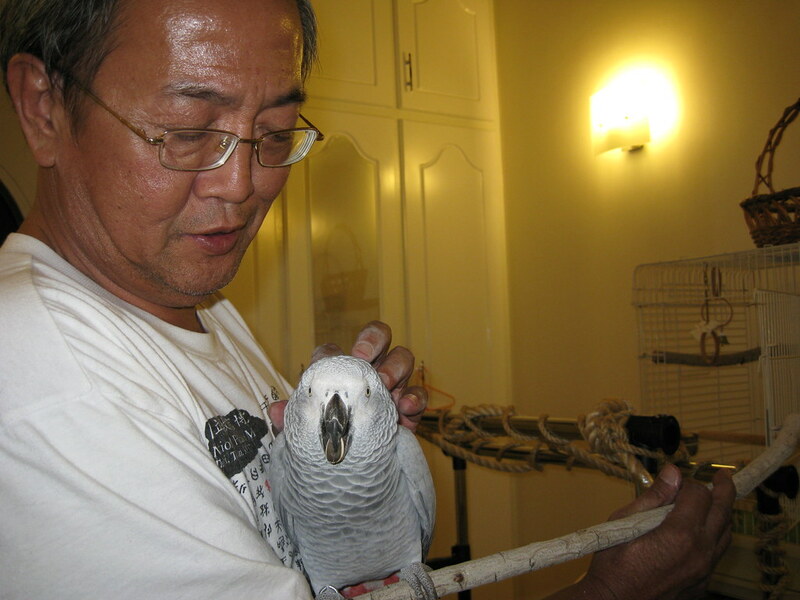 My collegue Richard Clarke send me the advert Ms Jessica Dakin placed in Oman Women's guid that she found a lost parrot. I called her to offer assistance and later went to see her. Jessica have a very little daughter who liked the parrot very much. I had thoughts of telling JD that care must be taken about the parrot, but I kept quiet trying my best not to frighten JD and influence her against the parrot. It was on Tuesday 21th Oct afternoon, I received a call from Jessica that her little daughter placed her finger into the cage and got a nip from Riamfada. Jessica told me she was already making up her mind to let me have Riamfada, but that nip prompted her into faster action then she anticipitated. I felt bad that I should have warned Jessica more strongly the other day. I was stunned at the rapid pace of events. I was not ready as I thought I will have 2 weeks. I have yet to get the makings of Tinkerbell mash. And the ladder to fix up perches, and the many other things. Muscat is not known for bird shops and stuff that parrot needed. A lot of that had to be made on ad hoc basis and I had not even started. I was still coming to grips of getting another bird into my life. 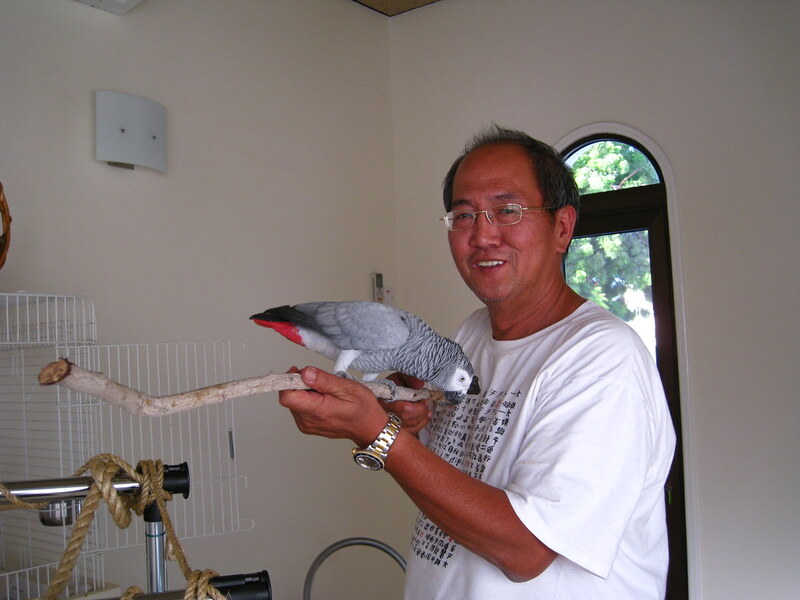 If you have read of my painful farewells to Tinkerbell (that I just recovered from) and that of Yingshiong, it was bittersweet that I am about to get into yet another relationship. Jessica told me she could delay that handover a couple of days. I gave a silent laugh inside as I thought I needed a couple of weeks and told her it will be all right, and I will take Riamfada in the evening. I thought with Riamfada in my home, that will light a fire under a procrastinator like me to get things done faster. 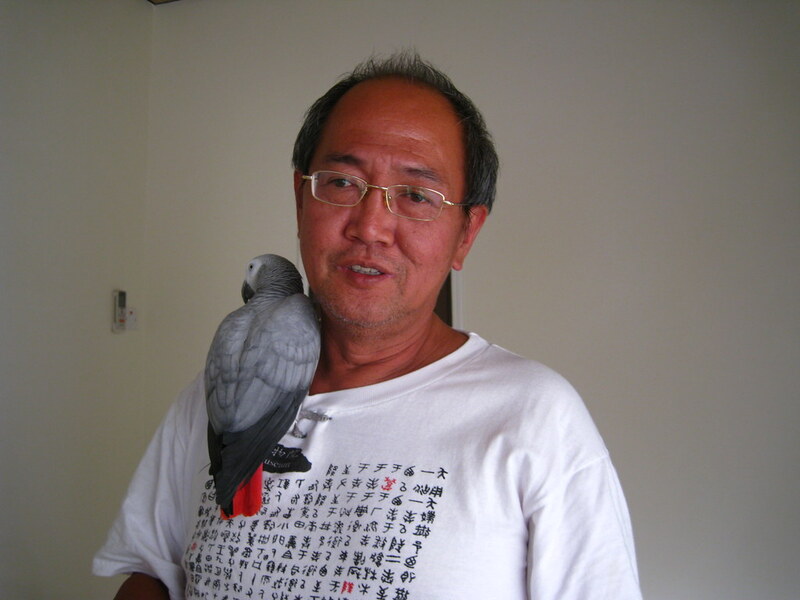 If you read of me and Yingshiong, you recalled that struggle I had to get his room done first, and then the rush to get the apartment done for YS, and that was an effort even though I could devote all my time to YS at that time. I was with my wife that evening at Jessica’s house. I wanted to take her photos to record the handover of Riamfada to us. Jessica felt she was in too much of a mess being a mum to 2 little kids and declined. She told me Riamfada handover to us was on two conditions. 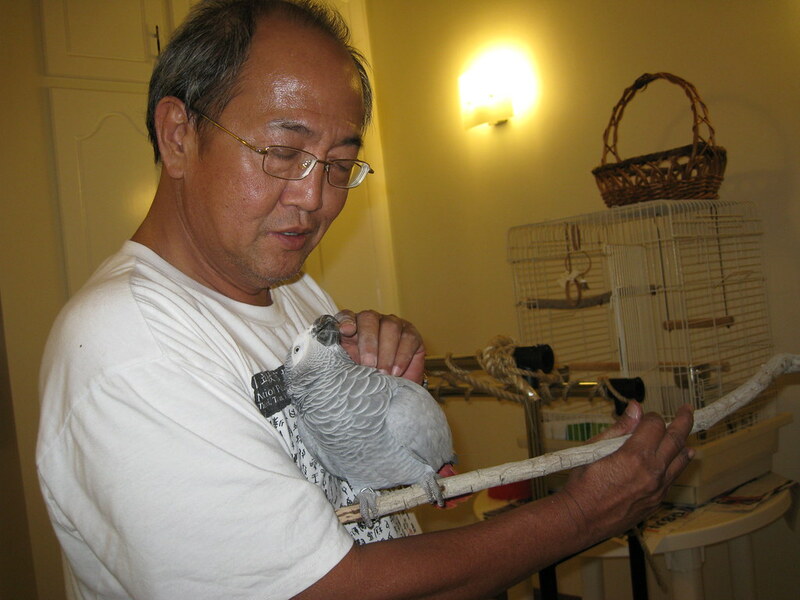 The first was that her daughter can see Riamfada again in 6 months time and that should I have to leave Oman, Riamfada will go back to her and she will placed her into an influential Omani she got to know and who love parrots too. I told her if she had read in full what I had written in the past, she would have known that all who dealt with me on any of my birds were considered as family to me, with many of them visiting us regularly or I visiting them. I assured her that she and her family will always be welcomed to see us and Riamfada. And that when Riamfada is better trained and accustomed to going out, we will he happy to go out on joint excursions with her family. The second condition she set was so much of a relief to me. That should we have to leave Oman and cannot take Riamfada with us, that there will be another loving home for her. This was what I would do in any case as you seen with Tinkerbell and Yingshiong. And of course, I happily agreed. This is a public declaration that I make here in addition to telling her that evening. I offered her 150 Omani Rial (2.6USD – 1 OR) for all that she spend on Riamfada and the rest to her favourite charity. She refused and only wanted 15 OR for the parrot cage she bought. The feeling in me as we drove off with Riamfada was indescribable. We reached home and introduced Riamfada to our two cats, both of them firmly in our hands. Back at home in her dedicated room, we rapidly found other flaws in my logic. In the case Yingshiong, his room was separated from living room by glass sliding door and wire mesh. In the case of Tink, she was out of cage most of time and she lived in the apartment alongside of us. The dedicated room to Riamfada meant she would have little interactions with us unless we go into her room. This will definitely be rectified. Riamfada is a character from David Gemmell Rigante series. Paulette Kershner, Rigante is set in Scotland. I cannot recommend highly enough just how good DG is and Rigante series in particular. When you are reading this and get to the point where Riamfada started to walk and run, you will want to write to me there and then. Please do that, any of you who are reading DG because of me. I understand your need to share. I will not try to describe Riamfada as I will not do justice to this exceptional spiritual entity brought out by David. I was told by DG fan club (http://www.legendreaders.com/index.php) that Riamfada was probably based on Lugh, an Irish deity , hero and high king of distant past also known as Lamhfhada (http://en.wikipedia.org/wiki/Lugh) . The cage was placed on the floor of her room and the cage door opened. I settled in the room with a book to keep her company. Riam will not step up. She refused to step on hand or on stick. She would back away from me into her cage. When she was out and on top of cage, attempts to get her step up would make her fly away. Her flight was not strong. We noticed that she was clipped on the right wing. It was an asymmetrical clip, and not a good one at that. That she could control her flight was truly remarkable to me. I thought her not stepping up was not a problem to me at all. I felt in a short time, that will be taught to her. I went back to the book I was reading. And now and then, just talked with her that she was so beautiful and how lucky we were to be allowed to care and love her. It was so easy to flow good thoughts to her to get her to settle in with us. She does however readily accept headrubs from me and my wife. She was quite well adjusted. A better girl than bitchy Tinkerbell as said by my wife. My wife was pleased Riamfada allowed her to do headrubs, something Tink refused her most of the time even at the beginning. Wednesday saw us buying table for Riamfada room so her cage could be placed on it and suff and Tink mash stuff . A check on the petshop in SAPCO Qurum reputed as the best petshop was shocking. Food sold for parrots consisted of mix of seeds and raw grains. They were moldy as well. This is totally not appropriate for Riamfada. 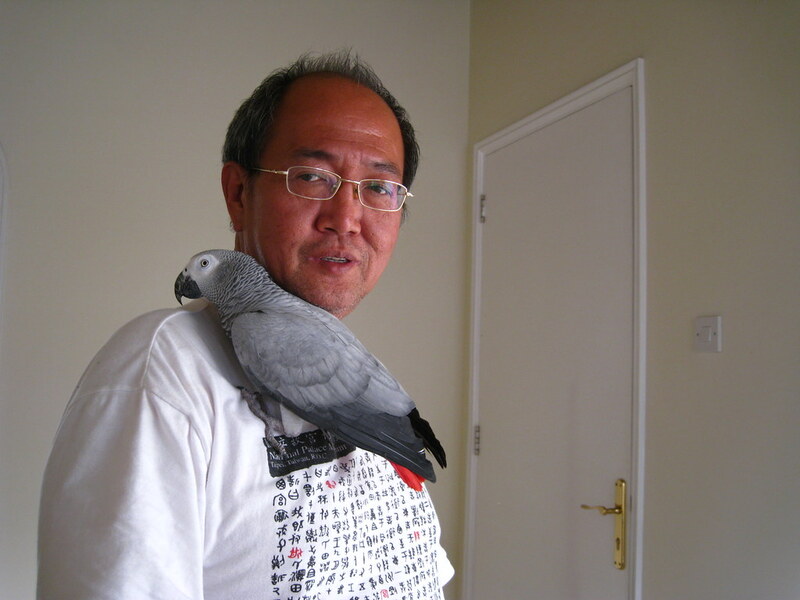 I could not blame Jessica who is into parrot only because Riamfada flew into her garden a few days back. She gave us what she bought from birdshop. To know first hand pet shops/bird shops stock this moldy seed mixture as parrot food is shocking. At least Jessica gave Riamfada a nice salad of carrots, apples and stuff. 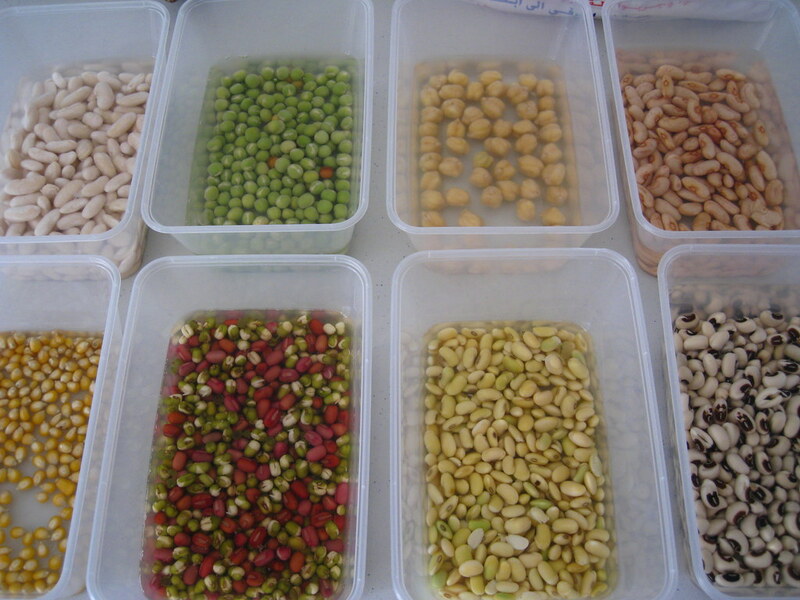 As at this point, the beans and stuff were already soaking over last 24 hours and cooking time will be this evening. I had to accelerate this instead of the 3 day cycle that I did before. But this is for a quarter scale and she needed to eat more than just salad. 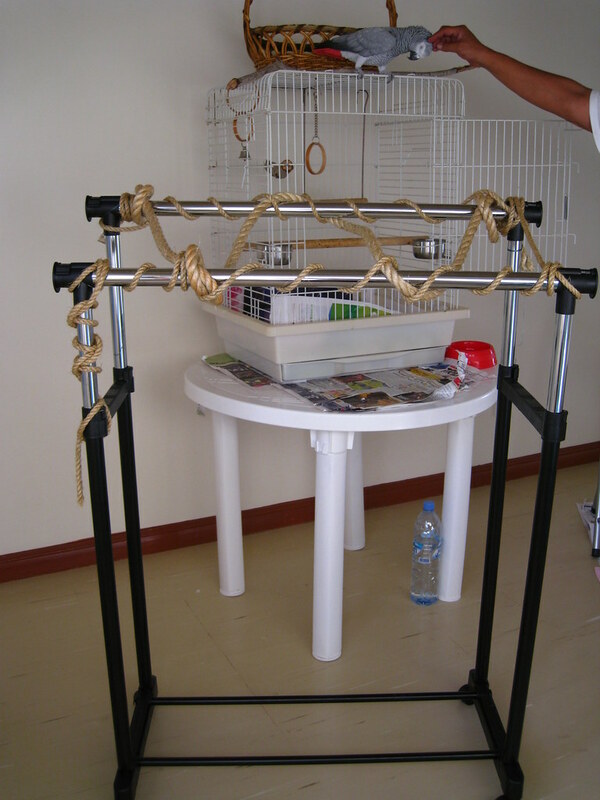 In the shopping about, I came across clothing rack like those parallel bars used in gymnastic. And you can adjust those height to make that uneven parallel bars. I thought what a wonderful stand for Riamfada. I bought two of that for Riamfada (and a third one for my wife to make wife happy) . We hunted desperately for sisal/hemp ropes for Riamfada finding plastic ropes only in shopping centers in city. We found that on Thursday night in an obscure shop in Seeb village after haunting gardening shops searching for that earlier. I tied those sisal ropes of different sizes kind of linking those bars to make that more amusing to Riamfada. A hostess trolley was bought and assembled. Riamfada’s cage was heavy and we thought placing that cage on trolley, we could more easily take her out to the living room where I spend lot of time watching the financial meltdown on the TV or next to me on laptop to Internet. This trolley not tested yet as I wanted to let the silicon sealant I added to set in addition to the screws. But it was wobbly enough for us to go buy another table this Friday morning for the living room to place Riamfada’s cage on. Just in case we cannot use that trolley and must carry the cage. On Thursday night I induced Riamfada to do a step up. It was a pseudo step up but I am not complaining. She had refused to step up on hand or stick. So I removed a branch from her cage and placed it on top of cage. She later got out of cage and was standing on that branch. I removed it and placed on my hand, talking gently and nicely to her while giving her headrubs that she liked from me. I took it as an ‘icebreaker’. Right now, my focus is to give her good food via that Tink mash that will be done tonight. Give her a nice environment in her room and in living room. I bought lots of nuts and stuff to see what she liked to use as treats in formal clicker training. That probably will start in 2 weeks time. The next couple of weeks will just be getting to know you time between Riamfada and us. Life is so different now that Riamfada is with us and I am so short of time. What a nice post. Thanks for keeping me up to date on your adventures around the world. What a beautiful bird.